"Kira is easy to bribe, but my integrity won't allow it." The remake is not a phenomenon limited to Hollywood; popular stories are remade time and again in the cinemas of other lands. 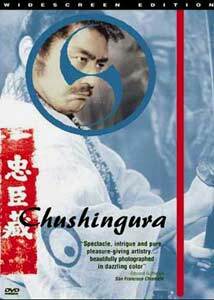 One of the most filmed stories in Japan, shot over a dozen times, is that of the play Chushingura; the most recent and best known of these versions is the disc up for review. Set in 1701, the story centers on the conflict between the Shogun's aged Master of Ceremonies, Kira (Chusha Ichikawa) and the young, idealist lord Asano (Yuzo Kayama). Insulted by what he sees as insufficient gifts from Asano, Kira makes things difficult for Asano, making him replace 500 mats overnight, at enormous expense, in order to properly welcome imperial envoys. The conflict comes to a head in the Shogun's palace, where Kira provokes Asano into drawing his sword, which is a capital crime. Although Asano only wounds Kira, he is forced to commit harakiri, and his lands and castle are forfeit. His men, led by the loyal chamberlain Oishi (Koshiro Matsumoto), are ready to fight and defend the castle, but when spies falsely let it be known that Kira has died, they surrender the castle without a fight. Oishi leads a dissolute life until winter, when he gathers the 47 samurai loyal to the Asano clan to wreak vengeance upon Kira. Beautifully shot, this film really takes advantage of the wide screen. The landscapes, scenery and action shots all make spectacular use of the wide canvas. Kazuo Yamada's carefully composed photography is nearly always gorgeous to look at. The dramatic music by Akira Ifukube underlines the tension and the drama well. The acting throughout is first-rate. Kira evolves in our understanding from a slightly corrupt bureaucrat to a truly loathsome fiend. Koshiro Matsumoto takes on a Hamlet-like part, ambiguously leaving one wondering whether this is some master plan, or whether he really has just taken to drink and geishas. Toshiro Mifune portrays his usual uncouth ronin, but here he unfortunately has precious little to do. In fact, other than the principal characters, the cast is so vast that it's difficult to get a handle on many of the other characters at all. Unlike Seven Samurai, it's hard to differentiate 47 samurai. The climactic battle sequence in the snow is exciting and will please any action lover. Inagaki uses a series of rapid cuts that anticipates the MTV generation by 20 years. This is the slightly longer U.S. version of the film. While some may find this picture slow in its progress to the finale, it is nonetheless an absorbing and well-made film. Highly recommended. Image Transfer Review: I dearly wish that this film would have been given an anamorphic transfer. With all the beautiful cinematography, one would think that it would be treated with respect. Unfortunately, there is shimmering everywhere throughout the movie, and the picture often appears highly digital. Horizontal lines, of which there are many, are extremely problematic. This is an excellent print, however, with hardly any visible damage and decent color. Black levels are somewhat lacking, but the mostly pastel palette comes through quite well indeed. Audio Transfer Review: The original Japanese mono audio is the only soundtrack provided. It is quite serviceable, despite a fair amount of crackle and hiss. The music has good range, and the dialgoue sounds decent, though I can't understand a word of it, for reasons quite unrelated to the sound. Extras Review: Absolutely no extras are provided. Subtitles are burned in, and appear in the black bars below the picture. Thus viewers with widescreen televisions will have to scroll the picture nearly to the top of the frame in order to read the subtitles properly, which is a quite poor design. Chaptering is adequate for a film of this length. A Japanese samurai epic centering on loyalty, honor and vengeance. What more can you ask? A beautiful picture, with an unfortunately lackluster transfer. Recommended nonetheless.